Often people aren’t sure what to do with persimmons. While Fuyu persimmons are eaten while crunchy and are good in fruit compotes and wintery salads, Hachiya persimmons are abruptly tannic when unripe and must be squishy soft before eaten. And if you’ve even tried an unripe one, you’ll know that I’m being kind when I say “abruptly.” Fully ripe, they’re quite sweet and even though people will sometimes pop them into the freezer then enjoy eating them like sorbet with a spoon, they’re a bit of a one-note fruit for me. So I was excited when I was reading through Good to the Grain by Kim Boyce and came upon the recipe for adding a second note by combining them with dark chocolate in these not-just-for-breakfast muffins. This is exactly the kind of baking book I like; straightforward recipes that get flavor from the ingredients themselves rather than replying on complex presentations or techniques. So imagine my surprise when I was reading the introduction to the book and found out that Kim thanked me for inspiration. To obtain fresh persimmon puree, wait until the persimmons are as soft as ready-to-burst water balloons. You can use any kind of persimmon as long as it’s super ripe, although Hachiyas yield the most copious pulp for baking. Yank off the stem, cut the fruit in half, and scoop out the jellied pulp with a spoon. There’s no need to haul out the food processor; I slightly chopped up the innards using a pair of kitchen shears to break up very large wads of persimmon pulp. But don’t overdo it—you’re not looking for baby food. People often don’t know what to do with an overload of persimmons. I’ve always dreamed of living near someone with a persimmon tree, since they’re really beautiful after all the leaves have withered away, leaving only the sleek orange fruit behind on the knotty branches. And also because they’re quite prolific and owners of the trees are usually generous when handing over extra persimmons to neighbors. Or so I hear. But as long as I live in a rather compact city where yards are few and far between, I guess I’ll have to be content with picking up persimmons at my local market. If you’re lucky enough to have a glut, or you buy them at the end of the season when the price drops, freeze the pulp in 2 cup portions and use them throughout the year for making muffins or persimmon bread. At first bite, these muffins might not seem sweet enough to you as there isn’t all that much sweetening added. But keep eating and I think you’ll agree that it’s nice not to have a muffin that’s sugary-sweet, as some muffins tend to be. Since Kim thanked me in the introduction of her book, I’d like to thank her for this recipe. Now if I could only get her to move in next door and plant a persimmon tree, then I’d really have something to be thankful for. Adapted from Good to the Grain by Kim BoyceThe original recipe said it made 8 muffins but I got a few more out of my one third cup-sized muffin tins. To be sure, keep a little softened butter on hand in case you need to butter a few extra spaces in your muffin tin.Fill the muffin tins so that the batter is heaped just above the top. These are denser than other kinds of muffins and don’t dome much due to the chocolate and the hardy buckwheat. Although I rarely call for specific brands of ingredients, Valrhona cocoa powder gives these muffins a deep-chocolate flavor and that’s what Kim recommends as well. 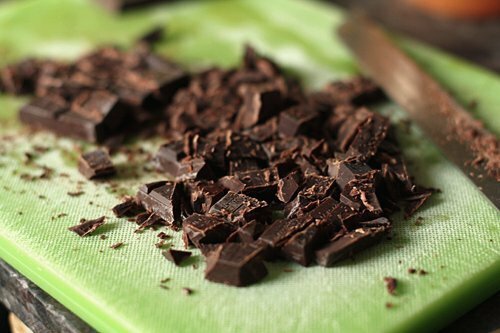 If you don’t have it, use very good quality cocoa powder (and chocolate) for best results. 1. Preheat the oven to 350ºF (180ºC). Butter eight of the inserts of a muffin tin (with a 1/3-cup capacity each). 2. 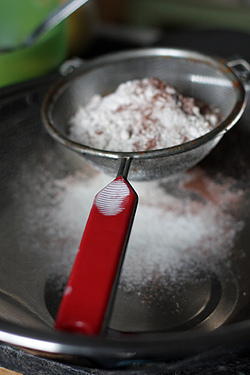 Sift together all of the dry ingredients into a bowl, pressing through any lumps of leavening, then tilt any bits of grain left in the strainer back into the mixture. 3. In a stand mixer, or by hand, beat the butter with the brown and granulated sugars until light and creamy, for three to five minutes. 4. Add the eggs one at a time, scraping down the sides of the bowl to make sure they’re incorporated. 5. Add the yogurt, then half of the persimmon puree. 6. Stir in half of the dry ingredients, then add the remaining persimmon puree. Gently mix in the remaining dry ingredients until almost incorporated, then fold in the chocolate chunks and any chocolate dust. 7. Divide the batter into the muffin tins and if there are any bits of persimmon visible in the batter, lift them out with a spoon and distribute them over the top. 8. Bake the muffins for 30 to 35 minutes, rotating the muffin pan midway during baking. The muffins are done when they still feel still soft in the center and spring back lightly when pressed. 9. Let the muffins cool for a few minutes, until you can handle them, then lift them out of the pan and set them on a cooling rack. Storage: The muffins are best the day they’re made, although you can store them in an airtight container for up to two days. They’ll be a little denser the next day. The muffins can also be frozen for up to two months. Note: Valrhona cocoa powder is available in well-stocked grocery and gourmet stores, as well as from Valrhona. In Paris, I buy mine at G. Detou. These are absolutely stunning! I’ve never had persimmon before, but i can only imagine how incredible it must taste. Plus anything paired with chocolate is fabulous. I just had my first-ever persimmon yesterday. While I wasn’t dazzled, maybe a recipe like this would make them more entertaining! I just bought some at an Asian market yesterday, as a matter of fact. The persimmon trees are one of my favorite things about returning home to N. California for the winter holidays. They’re so, so lovely. I’ve been buying persimmons by the bucketful lately here in Berkeley – and was just wondering last night if there was a dessert I could make with chocolate and persimmon! Spooky! Looks delicious! I recently tried baking with the Hachiya persimmons for the first time the other day–also made the mistake of trying the raw fruit–my mouth felt numb for about five minutes afterward! Now I’ve learned my lesson! I just went for plain persimmon cookies with pecans and raisins, but it looks like I need to try making this chocolate muffin next. here in Kentucky, my father in law recently cut opened a persimmon seed and found a “spoon” inside. you persimmon eaters probably already know that folklore says that means we’re in for it this winter, gonna be lots of snow to shovel! I love persimmons. That looks so good. I would never think of matching it with chocolate. I REALLY appreciate the tips on persimmons. I bought 2 Hachiyas last week and ate one right away. I was ready to throw the other one out because of the awfulness of the first one. After reading this I think if I’m patient, I’ll have a fantastic treat! Thank you so much for liking a muffing that’s not super sweet. As I always remind my husband, muffins aren’t cake! I bought one of these today. Not sure which one of the two you mention. I saw a recipe for steamed pudding on Chez Pim’s website and thought maybe… Before thinking too much trouble. Sounds delicious. I chopped up some partially ripe persimmons and added them with cranberries to a simple muffin recipe over Thanksgiving. I also added cinnamon, almond extract and a pinch of nutmeg. The tart plus sweet flavor made me think a similar combination would make an excellent scone, but I don’t make scones…. This post brings back some warm memories. My grandmother had a persimmon tree in her yard, and you’re right, they’re quite lovely when the leaves have dropped and the fruit is left hanging on the bare branches. They almost look like Christmas ornaments. Thanks, David. Again. I have bought them once in a while but mostly because, here in Germany, they’re called “Sharon” – my name! Funny. This is one to save and try. Thanks. AGAIN! I am lucky to have neighbors with a huge persimmon tree. When they have more persimmons than they want they line up the fruit along the fence in their front yard. As I walk home from work I stop and pick up as many as I can carry. I love to eat them and to bake with them. 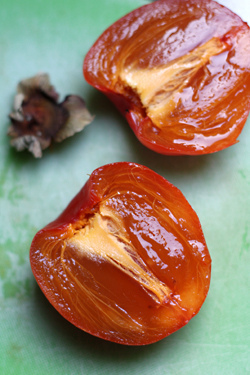 Thanks for a new recipe to add to my persimmon file. Your post is perfectly timed. I couldn’t remember what kind of persimmon I bought and waited patiently (for 2 weeks!) for it to ripen. When it started to get soft I decided to dive in: and my mouth turned inside out. Abruptly. Persimmons do confuse me, but at least now I know what I’m in for when I buy them. And with all the holiday treats (say for instance, eating enough caramel corn in a sitting to elicit nausea) having a muffin that isn’t super sweet is certainly welcome. I come from southern Indiana, US. Home of the annual Persimmon Festival! My 84 year old Mamma had a bumper crop of persimmons. There was an unusual late summer drought and it brought the tastiest crop of persimmons in decades. She rubbed hundreds of persimmons through (a sieve) and now I have a freezer full of persimmon pulp. Thanks for the wonderful recipe. In southern Indiana we mostly make persimmon puddings and persimmon rolls from the crop. I can’t wait to make these during the holidays. These look wonderful! Always good to find another way to use persimmons! I’m sure these are so delicious, but I will never know. I so love persimmons as they are, “au natural”, that I can’t bear to cook them. I eat them, one after the other, with a spoon right out of the skin. This winter season is special, because here in Puerto Vallarta, Costco is carrying persimmons, four for 27 pesos (about 60 cents USD each). It is so rare to find them here. After all, a persimmon is not something you see someone munching in a hammock under a swaying palm tree. What a nice image… I may just have to do that. oh David, you could move in next door to my parents, who have two fig trees, one persimmon tree, and an apple tree. Fall is an excellent time at their house, for the squirrels as well as the people! I’m sending them this post, just in case they have any persimmons left (the squirrels have been winning this year). I love this combination of persimmon and chocolate. Looks great! I love snacking on fuyus. Hachiyas, not so much, because.. you know.. the waiting. And like you said, that abruptness when what you deem to be a ripe fruit turns out to be not. But now I have an excuse to try hachiyas again, because those muffins really do sound great. Water balloons was EXACTLY the terms I used when the ripe persimmons dropped from our huge tree onto the brick patio below. Messy doesn’t begin to describe it. Ant-y, though, does. David, thanks for your consistently excellent blog & site. My partner and I are big fans. As it happens, we have an Hachiya persimmon tree worth lusting for in our very own yard (N California). After best efforts to appreciate persimmons I must say I’m still not a fan, although dyed-in-the-wool persimmon lovers will cut the top off a ripe fruit and eat it like soft jello in a cup. (Insert squirm here.) The tree is beautiful at all times of year, as you say especially bare-branch w/fruit (as it is now). Your muffin recipe (er, Kim’s) makes a great case for revisiting persimmons. Chocolate is always persuasive. Looks like I will need a ladder to pick as our persimmon-loving neighbors have de-nuded everything within reach. Thanks again! I adore ripe persimmons. 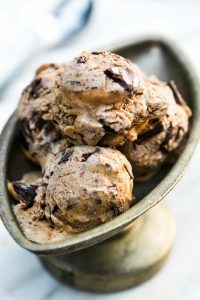 I love the taste and texture even if it is as you point out a one note flavor..Pairing them with chocolate sounds divine and can’t wait to try this recipe. My guess is that you mostly taste the chocolate but I’ll make them and report back. I love the fact that there is not too much sugar in the recipe. That makes them almost healthy. Right? these look so delicious! i can’t wait to try it out! Thanks! I bet this is delicious! Very lovely recipe and I can’t wait to try this one. This is also perfect for the coming Holidays. Oh goody. My friend gave me my yearly bucket of persimmons just yesterday – the squishy kind. Perfect timing. Thanks. Yum! I’ve never been a fan of eating persimmon dry and usually I let the wildlife have the fruit on my tree, but this year I can make muffins with them! Thanks. I have ripe persimmons! I am off to prep my ingredients so my kids have fresh, yummy muffins in the am! thanks! Having a bit of trouble understanding all the fuss about persimmons – yes, if you cut into them while they’re not fully ripe they’re a bit fuzzy in the mouth. Still, having a frozen, fully ripe persimmon (oh heck, it doesn’t even have to be frozen) was always delicious – pulpy yes, but amazingly sweet and slightly tangy. Just avoid the white fibrous material in the center and you’re good to go. I’ve always eaten these raw (never found a need to eat them another way), but your first chocolate persimmon bread recipe intrigued me. Now I really just have to make these muffins – thankfully I’ve got a box of Hachiyas that have been ripening for weeks. I made these today with my son. I had a bunch of Hachiyas that were ripe and I’ve been trying to find a decent recipe to use them in. Very tasty. I added a little turbinado on top for looks and a little extra sweetness. My little boy (2) loved them! I never am sure what to do with persimmons – I just love the word! But now I do! I was just talking about persimmons a few weeks ago with a fellow blogger. They’re native here where I live, but I’ve never had one. That said- are they likely to still be around the markets in a week’s time when I arrive? I’ll grab some then and try a few recipes…. are they currently available in all the paris markets? This recipe looks like a fun way to try persimmons for the first time. Thanks! mmmmmmm, persimmons are my favorite fruit. I would describe the flavor as something like a cross between a sweet juicy plum and a pumpkin pie. Perfect for this time of year! Crunchy fuyus are ok, but the soft, squishy hachiyas are the best! You can spoon them if you like, but I just bite into them like I would a super juicy peach. You know what be SUPER cool? Use Chocolate persimmons to maker this recipe. I just had one on Tuesday and they are tasty. I just love the double chocolate concept. So , David, get thee down to my garden in St Jeannet and help yourself to all the persimmons you could want! I’m usually giving most of the fruit away as one can only eat so many for breakfast but now I can’t wait to try the recipe. Thank you! I have four of these sitting in my fruit bowl right now, and all they remind me of is an old still life painting. I had no idea how to eat them or what they should taste like. I think my introduction to these should be in muffin form! My friend has a fuyu persimmon tree. Luckily he doesn’t like persimmons – more for me! Since I was knee deep in persimmons, I gave some to another friend who uses her food dehydrator to dry them. 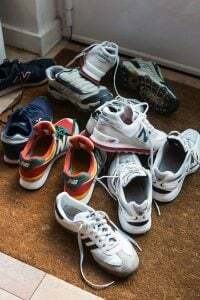 She then returns them to me dried. They make a delicious snack when dried. 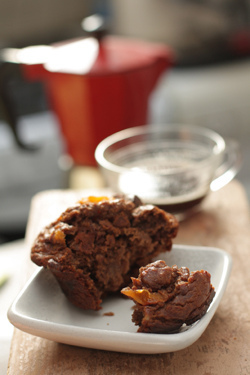 Now that persimmons are down to 75 cents a pound at the local farmers market, I’m going to buy the hachiyas and try your chocolate persimmon muffin recipe. It sounds like a winning combination! Is this what they call Kaki here in France? 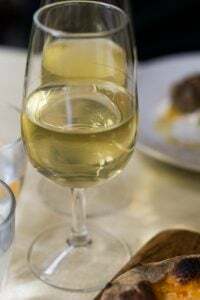 Have never known what to do with them, and always passed them by in the market, I will try them in this recipe, thanks! I wonder what what is the right amount of the AP flour, 140 g or 1 1/2 cup. If I am not mistaken 1 cup of AP flour is 140g. Brilliant – a new choco-combo recipe. Merci for the inspiration! I’ve always wished my neighbour had a persimmon tree – Fuyu or other. I love my baked goods barely sweet and I’d make these lovely muffins just as this recipe is written. friends and neighbors. I didn’t know you could freeze them, back then. 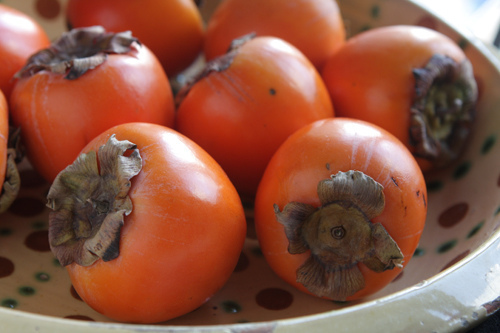 Angelainprovence: Yes, in France they’re called kaki and the Fuyu variety are called Sharon. I’ve not seen other varieties in France, but I know others exist elsewhere. Maureen: I remember seeing those at Monterey Market in Berkeley. They are pretty good and that is a fun idea using them in these muffins! Michele: I love Fuyu persimmons a lot and eat them as is as well, or tossed in fruit salads. Jennifer: Persimmon seasons vary depending on where you live, and what hemisphere. But in the United States and in Europe, late fall and winter are persimmon season. I’ve been patiently waiting for two persimmons I bought almost 3 weeks ago to ripen up (I think some people have no idea what they are, and they actually refrigerate them. That should kill any ripening to be done). Anyway, they are a treat I remember as a child in Italy. So many Italians who emigrated here to Canada sneaked in fig trees from their visits overseas (fig trees do in fact grow in Southern Ontario, yes, even with snow) but I’ve never figured out why no one brought a persimmon back to plant here. Having them fresh from the tree would is a luxury. 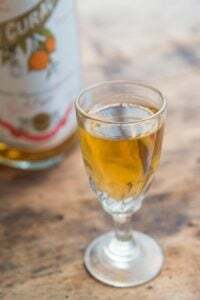 Since I’m still waiting for my persimmons to ripen up, I think I’ll use them in this recipe. Just in time for the holidays. Would you think I could use chestnut flour instead of buckwheat? I am sorely tempted (also because chestnuts are in the same season than persimmons). 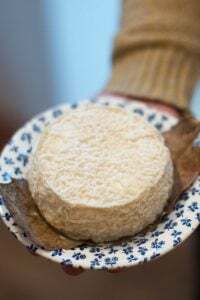 Nathalie: I don’t have much experience with chestnut flour but it would likely be a good substitute. (I might use a tad less because it might be heavier?) Let us know how it works out if you try it..
David, these sound heavenly. We haven’t seen any persimmons in the stores yet, and I live way too high in the pine/snow country to have any at the roadside stands. You are right, everyone with a tree is very, very generous…when I was a teenager, we got a fabulous steamed persimmon pudding recipe from a neighbor along with a box of them, and its been our favorite Christmas dinner dessert ever since. I cannot tell you how thrilled I am to be receiving these wonderous recipes along with such glorious stories about the ingrediants. When I see that I have one….I sometimes wait, until I have the time to really sit and enjoy every word….and the photos….well I could just go on and on and on..you get the picture. Thank you so much!!!!! 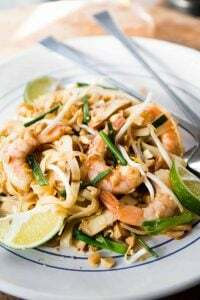 Thank you so much for choosing one of my favorite recipes from GTTG. I feel the same way about persimmons and always dream of one day having land with a long driveway lined with persimmon trees. It would be so beautiful come fall with all the fruit hanging there. Then someone reminded me how messy it would be when all the trees began to drop their fruit. Oh well, one can dream! I recently got a persimmon (yes, just one) in my weekly panier and had no idea what it was. I ate it while it was soft, but not mushy. I really did not enjoy the film it leaves behind on the tongue. Does this mean I ate it too early? Should I have waited for a bit more mushiness? I’d like to try it again, sans film. My parents are the exact people that you describe, ones with a giant persimmon tree in the backyard and always having more than enough persimmons than they know what to do with. I was recently gifted with 70+ persimmons to take to my chef for our pastry class. 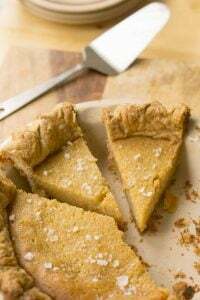 I’ve become initmately familiar with persimmon cookies and persimmon cake over the years (as that is all my parent’s have ever made with them), so I’m thrilled to learn of a new recipe. I have several frozen bags of pulp in my freezer and am now looking forward to putting them to good use. @ david & Nathalie regarding chestnut flour… I use chestnut flour because I’m gluten free. It is lighter than buckwheat, and also sweeter. It actually bakes up with a very nice light crumb and is very popular for use in cakes because of this. 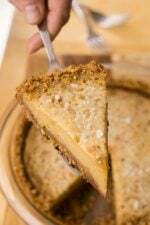 Using chestnut flour would be a great substitute for buckwheat flour, but will make the overall flavor sweeter. That’s a good idea, and I may have to try it both ways when I make this- just to see what happens! Hope this helps. David, I have been given a bag full of Fuyu’s. Do you know of a way to soften them so I can use like the Hachiyas? 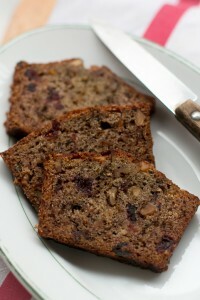 They work well as a substitute for carrots in carrot cake recipes. Just add a teaspoon of vanilla and omit the spices. Or, what the heck, leave the spices in for an added dimension. The result is a fudgy, almost low fat chocolate gateau. Where is the edit function! In my previous post, I neglected to add that I make two versions of carrot cake, one classic, the other with a 1/3 cup cocoa powder added and spices omitted. Obviously, the fudgy chocolate gateau is the chocolate version. So different & totally unique muffins these ones. I’d never really come across anything that sounded inviting to ‘do with a persimmon’.., thanks for sharing this. Somehow I skipped over this one in Kim’s book (probably because it always opens right to the oatmeal pancakes). Karen: You can let Fuyu persimmons ripen at room temperature just like Hachiya persimmons, until very ripe and very soft. They don’t get as jellied as Hachiya persimmons when ripe, but they work. Jennifer: Thank for that information. I’ve been wanting to try a Castagnaccio, the Italian chestnut cake made with chestnut flour, but haven’t gotten around to it. Recipes for it usually don’t include sugar so it makes sense that it’s quite sweet. Marcella: Hachiya persimmons should be very, very ripe before eating them, as shown in the photo in the post. Kim: I love your book and thanks for creating this recipe. Happy to add a new persimmon (and chocolate) recipe to my breakfast table! David, we have some amazingly ripe persimmons at the market right now. I’ve been baking with them for the past two weeks. I first made a persimmon custard; it came out OK but not spectacular (I ate it anyway.) The second time I baked a simple persimmon crisp and it turned out great. The persimmons really shined through. Your muffins with chocolate and persimmon sound like they would be really tasty. A bit similar to pumpkin and chocolate, which is a flavor combinationn that I adore. I’m thinking about making persimmon jam next but I have no frame of reference. Have you ever had or made it? I’ve only seen chestnut cake with sugar- would love to see one without…they’re naturally gluten-free and it would be nice to make something this time of year that doesn’t have sugar, but is still sweet…. may have to play around with that if you don’t post one soon..
@ Nisrine- I cheese out and do freezer jam, which is way less time consuming- but I think if you scoop out the persimmons, add your sugar and pectin, you’re good to go… of course if you want to do it the long way- I don’t know a thing about that…..I think if you added some candied cherries and some orange zest, you could make a nice persimmon marmalade. My grandmother had a persimmon tree. Wish that I had some of them right now to try these muffins. YUM! This is SO weird because I just made Deborah Madison’s yummy Persimmon bars with lemon glaze (from her “The savory Way” cook book ) yesterday. (Well, maybe it’s not so weird because this is the season for persimmons…) I used very very ripe Fuyus that I got for really cheap–and I took my hand away from heart and used some in the bars since Dh likes them in a cake instead of selfishly eating them all by myself. I know you can eat Fuyus hard and they are nice that way but I ADORE all persimmons very soft. David, as per normal you’ve come to my rescue with a much needed recipe. I’m at Spannocchia (agroturismo destination near Siena) working as a winter farm intern and we have several trees bursting with “kaki” persimmons and are at a loss as to what to do with them. I can only eat so many as desert after every meal. The dining room table in the castello is currently overflowing with the ripe fruit and we’ve only made a small dent in one of the trees in the orto. My one issue is the lack of buckwheat flour in the castle cupboards. I’m sure I can find a ways of substituting but if you have any sage wisdom to impart before I make a fool of myself it’d be much appreciated. Thanks for your continued awesomeness! Buckwheat flour sounds inspired with persimmon, and then with chocolate as well? Yum. I’ll bet that subbing nibs would be nice too. These muffins look fantastic. I am one of those folks who never seems to know what to do with persimmons. But these seemingly decadent/ quasi-healthy muffins are really lovely. I bought a few persimmons at the supermarket the other day (the ones that are flatter… i believe hachiyas) because i like to eat them out of hand. They were hard when i bought them and it has been AT LEAST two weeks and they are still rock hard… I am worried that they are going bad, is this just a case of the supermarkets picking wayyyy under ripe fruit and now it will never ripen correctly, or should I just wait longer? I learned something today and I am now sorry to have thrown my two huge fruits away because of the VERY bizarre taste they had, quite bitter and the inner of the fruits hardly yielding to the spoon…. I just knew about one sort, the one I simply call khaki…. and which I got to know and love in Italy. I shall pay more attention next time.,, And I had the same experience as Caitlin; only I did buy them at a ‘primeur’ and they might have been named persimmones. After about 10 days I lost patience and I thought I MUST prepare them now or they’ll be bad – in the end, they were…. because the taste was really not inviting. And the fruits were absolutely huge (I think I had nearly 750 grs with two fruits). I have five trees that produced 2,000 lbs. of lovely persimmons this year. You can come and have them all! Perhaps next year I might try this recipe but my husband and I do not like them. They are pretty to look at though. Hi David, sorry for being a nuisance and asking about substitutions…. this sounds like a lovely “must try” recipe… however, i am extremely allergic to eggs… any ideas on how this gets adapted egg free? nikki: I don’t know anything about egg substitutions but perhaps there are online resources that specialize in that, where you can find the answer. I have a friend who makes persimmon pulp from his trees. He currently has 300 lbs stored in his freezers and can’t give it away fast enough. This will be a nice way to use up a cup or two. I’m a librarian who daydreams about baking while at work. I just want to say that I’m enjoying your book, “Ready for Dessert” (which I promptly bought a copy of after greedily snatching it from our shelf for new books.) As I will be having a jaw surgery right before Christmas, I consoled myself by making your persimmon cake and I just want to say that it turned out jaw-droppingly delicious. I used fully ripened Fuyu persimmons though. I was only willing to part with a few slices that I brought to the library and it was a hit! Nobody could guess what contributed to the beautifully moist texture and the elusive aroma. I’m glad to report to you that as of now, all copies of your book are out and there’s going to be a waiting list…. Thanks for a delicious recipe! I made it with half Hachiya (3) and half Fuyu (3) persimmons, as that’s what I had on hand, plus some Greek yogurt. They turned out just great. So glad a friend pointed me to your blog, as I’m already a big fan from working my way tastily through your ice cream cookbook. Keep up the good work! I made these muffins today with half Fuyu/Hachiya persimmons as Sara did. I also used ww pastry flour in place of AP flour. They are fabulous, not heavy at all and I got twelve large muffins from the recipe. I’m sorry I will have to wait until next year for more persimmons. Oh my lord, persimmons are my favorite fruit and chocolate is my favorite goody. This is perfect. Thank you! Hello, can you please explain how to puree persimmon? 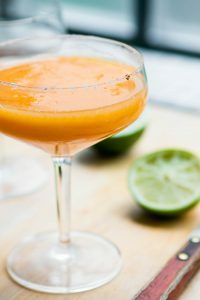 To puree a persimmon, simply split a very ripe Hachiya persimmon in half, scoop out the pulp with a spoon, and puree it in a blender, food processor, or pass it through a food mill. 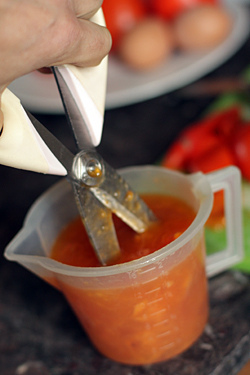 You can also use a fork and mash it very well or use a pair of scissors to break up the larger pieces, as shown in the post. Thank you, I really enjoy your blog, will be making these muffins on Sunday.